My copy was bought for Christmas in Good condition through Mile High Comics, it feels like it has serious water damage to it. Issue opens with Limbo monsters coming out of a pet shop. There is an editorial note stating this issue occurs prior to New Mutants 37. Which, to me, meant this was an Inferno tie-in but it really is a Secret Wars II tie-in. Look at Power Pack, being so cute, trying to tie-in to Secret Wars II. The demons, I had forgotten what they were, are heading towards a museum. The demons are hoping to open a portal back to Limbo. They know that Illyana has been taken off the board, as Secret Wars II issue eight has happened and then New Mutants 37. Though this issue is not included on that website, so I’m not sure how accurate it can be. The demons steal a mummy and now they need a baby to sacrifice. Magik and the Beyonder have forced these demons to be stuck on Earth. Crazy how much this is connected to Inferno but that is still three years from now. Downtown, several hours later. Jack, who I can’t remember his name without looking it up – everyone else, I know but Jack eludes me – informs us that Christmas is tomorrow. Mrs. Powers is in the hospital, which am I wrong, isn’t she in the hospital, like all of the time? I feel like she is when they had the Thanksgiving issue (19) and their grandmother was in the hospital during Thor and the Warriors Four miniseries. Maybe that’s hwy I think it happens so regularly. Since their mother is in the hospital, and with the bills, Christmas isn’t going to be plentiful as it typically is. Kurse, a Power Pack villain – maybe their main one – put her in the hospital. Power Pack flies up to her hospital room window and overhear the doctor tell their father that their mother isn’t recovering fast enough. The doctor can’t explain why it isn’t happening, it is like she doesn’t want to fight that hard. She has an infection and if it breaks by midnight, she might just make it. The children are in tears, as they can’t believe that they have these powers and can’t do anything to save their mother. New York City, being the small town that it is, three windows down – the Limbo babies are escaping with a baby. A nurse shouts from the floor above what happened, so that explains that their mother and the maternity ward are not on the same floor – as that would be confusing. They actually took several babies, so Power Pack gives chase. Katie takes one of the babies back, these poor babies! It does not appear that the demons are supporting their necks. 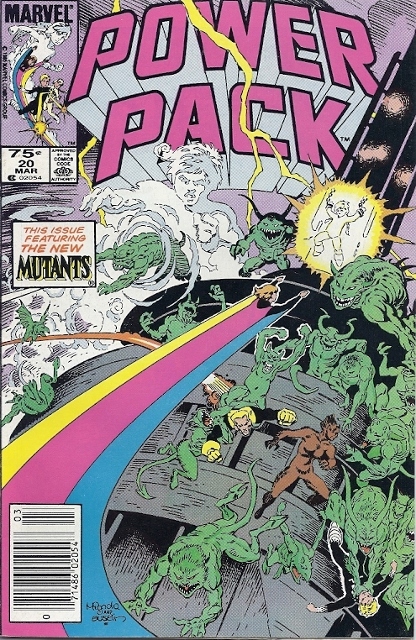 Power Pack engages the demons in a fight and try to keep the babies safe. One of the demons notices Katie and tells the others to drop the babies and they plan on getting Katie. That page long panel on the right, how intense is that! The baies are save, and I am super relieved. Though I can’t believe their plan is to just ditch them somewhere so that the police can find them. I know they have to protect their secret identities (as if their parents ever found out, they would be driven insane – for some reason. Conflict, I suppose) but let’s at least hand the babies, gently, to the police officers. Katie is going through a pouch that one of the demons dropped off, She searches into it and locates Kitty Pryde’s Salem Center Public Library card. 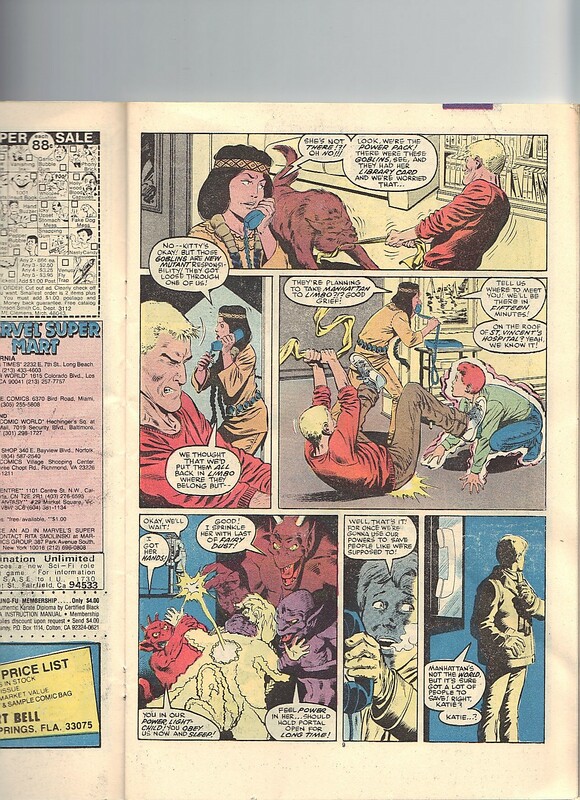 They stole her card in New Mutants 36, I really need to reread these issues. Power Pack does stick around until the police arrived. Alex worries that Shadowcat may have been sacrificed. Julie is sure that hasn’t happened (it hasn’t) but they should call the X-Men to make sure. Later, in front of the Hospital. The Power children are coming up with their cover story. Julie and Jack are going to call their father. Alex and Katie are going to call the X-Mansion, well he calls, Katie starts wandering away, to the delight of the Limbo demons. Dani answers the phone and tells Alex that Kitty isn’t there. Kitty isn’t in any danger, as Dani says she can call back later. Dani explains that Kitty is okay but all things Limbo are New Mutants responsibility. Why Wolfbane is playing tug-o-war with Sam, is beyond me. She isn’t a dumb animal when she is in her wolf form. 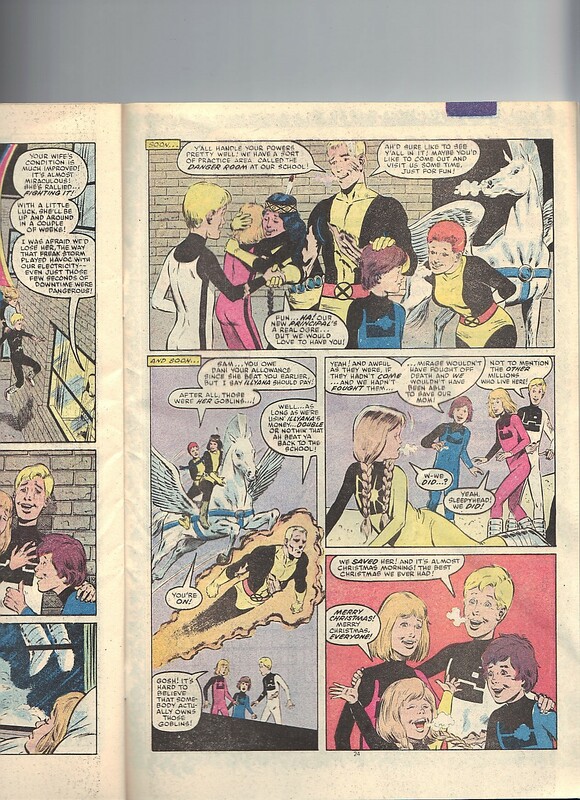 Dani agrees to bring the New Mutants to St. Vincent’s Hospital. That panel of the demons taking Katie, super creepy! Poor Alex notices his younger sister is missing, far too late. Across town. Jarvis and Franklin Powers are doing some last minute Christmas ingredient shopping. Franklin gets a vision of a mall Santa being hit by a taxi and shouts at the mall Santa, saving him. Upstate New York. Dani has updated Cannonball and Wolfsbane, they are the team tonight, as the others are doing some last minute Christmas shopping. Dani summons her horse, Brightwind, and that’s how the three of them are going to the city. Cannonball isn’t impress and will fly on his own terms. Dani got Brightwind when they visited Asgard in X-Men Annual 9, when she became a Valkyrie. Soon. Cannonball loses the bet that he will get there before the ladies. 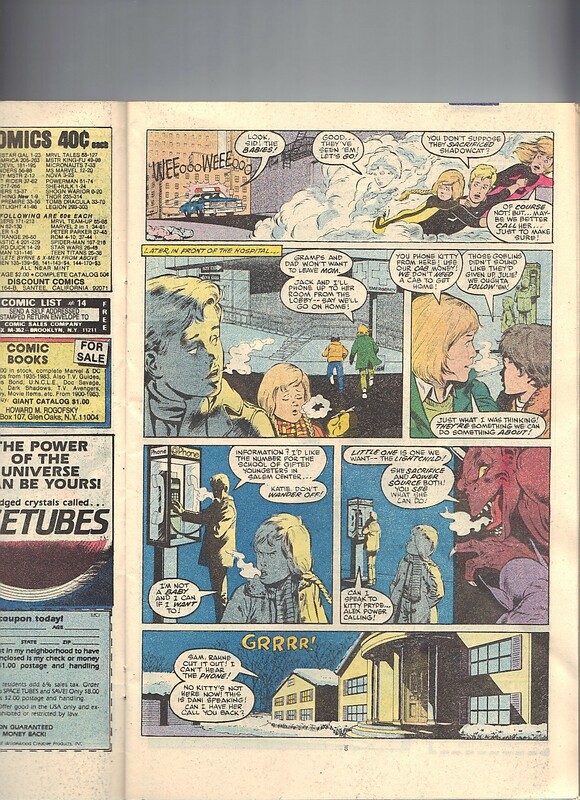 Power Pack is slightly disappointed, as they were hoping for the X-Men, not the junior team. Alex is dealing with all types of guilt, first, it is his fault his mother got injured and now Katie is missing – on his watch. Dani’s ears perk up at the news of their mother’s illness. She checks in on their mother and confirms that Death is coming from her – Dani Moonstar, a bastion of hope! Cannonball, like a jerk, tells Dani that she should fight Death off. Which is great, put four childrens’ hopes as high as possible. Dani is upset at Sam, and rightfully so. As a Valkyrie, she is suppose to collect the dead and not drive off Death. Dani looks up and sees a dark angel. This wakes her up, if Manhattan gets pulled into Limbo, millions will die – which sadly, is more important than one woman’s life. Somehow, in the very next panel, she changes her mind and will stay behind at the hospital. Everyone else will head towards the demons. Wolfbane turns into her wolf form and Jack calls her a werewolf – she doesn’t fight him on the label. Wolfsbane starts tracking the demons scent. Dani attempts to thwart the dark angel and turns Dani into a skeleton. Dani resists the attack and pushes her advantage. Downtown. Magik’s other name is, Darkchild, so they call Katie, lightchild – They are not the most clever sort of people. The demons are drinking to their soon-to-be victory. The demons begin the process of opening the portal to Limbo. The teams start trying to get to the stop of the skyscraper. The process results in a massive power outage. There are about fifty demons. The demons start fighting the children. As the island starts phasing into Limbo, there are all types of explosions as gas mains are erupting. Alex notices that the area around the hospital has gone dark. Dani keeps fighting the dark angel from getting to close to the hospital. Mrs. Power’s spirit does start being drawn to the dark angel. As Manhattan gets more into Limbo (how crazy that they are this successful) the demons are getting stronger. Cannonball crashes through the wall that is keeping Katie prisoner. Katie is bursting with raw energy. Dani fights off the dark angel, as the combined teams have succeeded. Katie has become solid again and falls from the skyscraper, luckily, Julie catches her. Katie isn’t breathing but as Sam is thinking of what to do, she comes around. The teams get back to the hospital, where Dani and one of the horse people who gave the Power children their powers is there. They overhear that their mother is going to be okay. The two teams hug it out, as tonight has been a good night. Pretty nice comic.